The 2nd edition of the IEEE Soft5G workshop has been held in Seoul on Friday 11th. Thanks to the distinguished keynote speakers and to the authors the workshop has been a great success with more that 25 attendees in the room and with very interactive sessions. We look forward to a great 2017 edition in Bologna, Italy. Accepted paper will be indexed by IEEExplore. 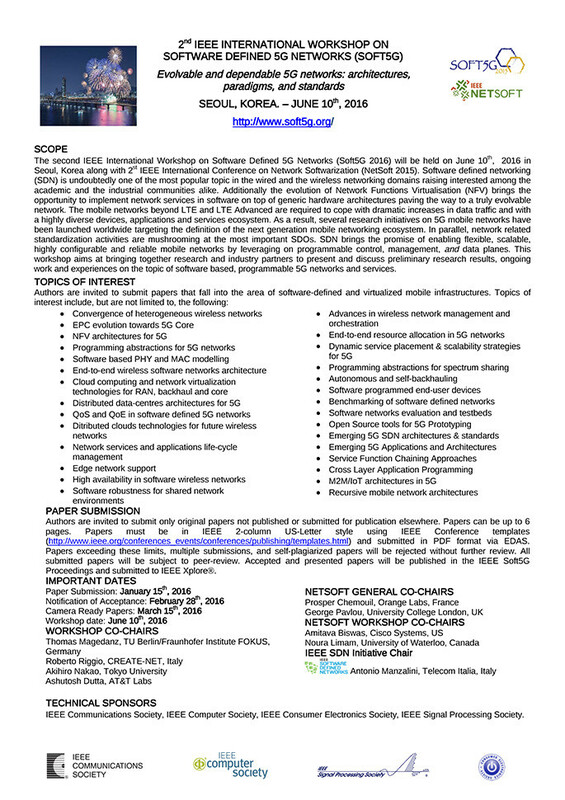 The second IEEE International Workshop on Software Defined 5G Networks (Soft5G 2016) will be held on June 10th, 2016 in Seoul, Korea along with 2st IEEE International Conference on Network Softwarization (NetSoft 2015). Software defined networking (SDN) is undoubtedly one of the most popular topic in the wired and the wireless networking domains raising interested among the academic and the industrial communities alike. Additionally the evolution of Network Functions Virtualisation (NFV) brings the opportunity to implement network services in software on top of generic hardware architectures paving the way to a truly evolvable network. The mobile networks beyond LTE and LTE Advanced are required to cope with dramatic increases in data traffic and with a highly diverse devices, applications and services ecosystem. As a result, several research initiatives on 5G mobile networks have been launched worldwide targeting the definition of the next generation mobile networking ecosystem. In parallel, network related standardization activities are mushrooming at the most important SDOs. SDN brings the promise of enabling flexible, scalable, highly configurable and reliable mobile networks by leveraging on programmable control, management, and data planes. This workshop aims at bringing together research and industry partners to present and discuss preliminary research results, ongoing work and experiences on the topic of software based, programmable 5G networks and services. Authors are invited to submit only original papers not published or submitted for publication elsewhere. Papers can be up to 6 pages. Papers must be in IEEE 2-column US-Letter style using IEEE Conference templates and submitted in PDF format via JEMS. Papers exceeding these limits, multiple submissions, and self-plagiarized papers will be rejected without further review. All submitted papers will be subject to peer-review. 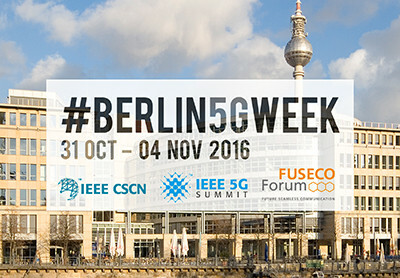 Accepted and presented papers will be published in the IEEE Soft5G Proceedings and submitted to IEEE Xplore®.